I was never into sports. I tried my hands at a number of sports, but I was always below average in most of it (you got to give me some credit for trying at least). In 2010, my roommate got me addicted to watching football. We would keenly follow all the matches in English Premier League and La Liga. 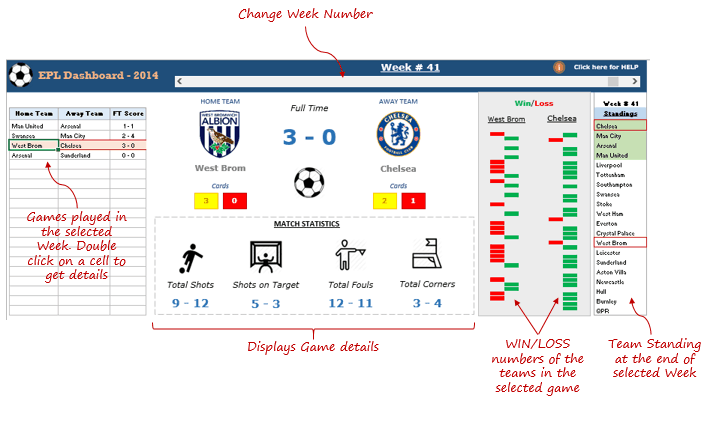 But I am better at making dashboards, and in this tutorial, I will show you how to create an Excel Dashboard that analyses English Premier League games of the 2014-2015 season. Use Scroll bar to change the week number. Note that as you change the week number, it shows the games played it that selected week and the ranking of the teams at the end of the week. Double click on the game result cells to get the detail for the game. As soon as you double click on the cells that have the game results, the match statistics update along with the logo of the clubs. It also shows the total win/loss numbers of both the teams for the entire season. For example, if I double-click on a game of Chelsea, it would show only 3 lost games for Chelsea (in the red color bar in the win/loss chart). Click on the help icon to show instructions. Click on it again to hide the instructions. I got all the data from www.football-data.co.uk. It has similar data for other leagues and competitions. I got the logos from Wikipedia. What all goes into making this dashboard? Scroll bar to change week number. Excel Table and structured references (a must for data-driven dashboards). Named Ranges (this dashboard uses Picture Lookup technique to display the relevant icon on user selection). A little bit of VBA. Are you a football fan too? Do you like it? Let me know your thoughts by leaving a comment. A Guide to Creating an Excel Dashboard. KPI Dashboard in Excel – Part 1 | Part 2 | Part 3. If you want to learn to create world-class Excel Dashboard, consider joining our Dashboard Course. Click here to know more about the course. 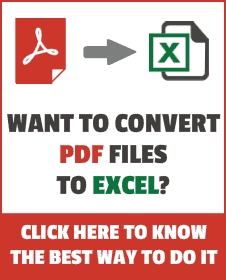 Can i have the excel file? after download from the link, it appears garbled message. Hey i like your work its informative and very visual also i do love to learn as much as i can from you. but i have a couple of ideas and models i have been using in soccer prediction and if you don’t mind can we discuss that? How easy is it possible to set this for 24 teams / 46 games?? Hi Sumit, excellent job! Looks great. The scroll bar is an inspired choice for navigating through the season. Out of curiosity, what part did you use the VBA for? This makes my head hurt thinking of the possibilities. I have futbol die-hard friends and they are having kittens over this.